All Products > "25214243 Multiplex FunCub"
The multi-talented all-rounder, take off wherever you fancy - that's what the FunCub lets you do. 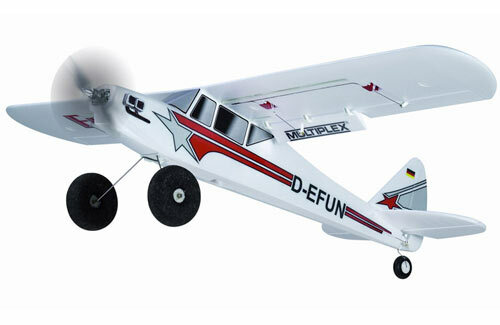 Thanks to the large, lightweight EPP wheels and powerful brushless power train you can takeoff and land this model from virtually any airstrip. Those big wheels, oversized prop and a power system with plenty of "oomph" - are the perfect recipe for big flying fun in at smaller sites. 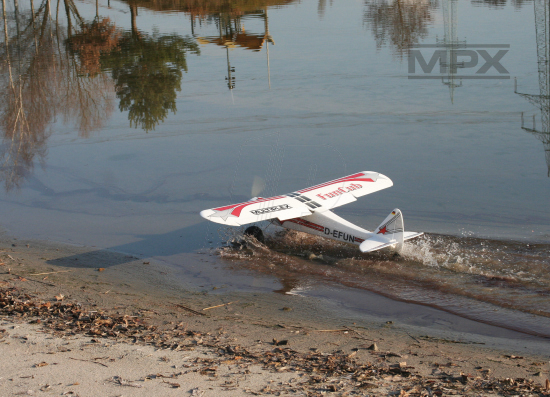 We can even offer a floats set, converting the FunCub into an excellent aircraft for water or snow. It�s simply a great all-rounder. With its docile flying characteristics and super slow-flying characteristics the FunCub is great for the beginner while he learns to fly, while the advanced pilot can impress on-lookers with spectacular aerobatics (loops, rolls, inverted). Features durable moulded ELAPOR parts, GRP spars, all small plastic items and linkage components, decal sheet, comprehensive illustrated instructions.Please Note: Additional items may be required to complete this model. If you require further information please contact us for assistance.